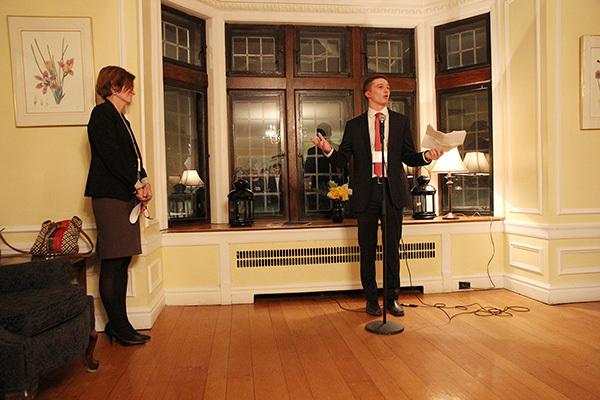 Ann Tierney, Vice-Provost and Dean of Student Affairs, looks on as fourth-year Loran Scholar Callen Hageman speaks about his experiences at Queen's and with the Loran Scholars Foundation program. Callen Hageman (Sc'18) speaks about the Loran Scholars program and the experiences he has gained over the past four years, during a special event hosted at the University Club. Catherine Fowler, Chief Operating Officer and Acting CEO of the Loran Scholars Foundation, speaks about the special relationship between Queen's, the foundation and the 16 scholars at the university. Some of the 16 Loran Scolars at Queen's University gathered with their mentors as well as staff and faculty members for a special recognition event at the University Club. Queen’s is home to many outstanding students and this includes those who have received a scholarship from the Loran Scholars Foundation. On Thursday, Jan. 18, a special event was held to recognize the university’s Loran Scholars as well as the mentors and staff and faculty members who have supported them along their educational journey. Each year, 34 students are selected nationwide to receive the multi-year scholarship. Currently, Queen’s has 16 Loran scholars who have arrived from across the country to pursue their studies in a wide range of disciplines. More than 5,000 students applied this past year; scholars are selected on the basis of character, commitment to service and leadership potential. In the past two years, two Queen’s Loran Scholars – Claire Gummo (Artsci’17) and Iain Sander (Sc’17) – have gone on to become Rhodes Scholars. The Loran Scholars program provides students with a tuition scholarship and a living stipend. They also receive personal and professional development opportunities, participating in enterprise, community development and public policy related summer employment, often including at least one international experience. The program connects students with a mentor – individuals who are influential in communities, government or various disciplines – for the duration of their undergraduate studies. For more on the Loran Scholars Foundation, go to loranscholar.ca.